Acadian Genealogy Homepage; Acadian Surnames (Abraham to Buote)! 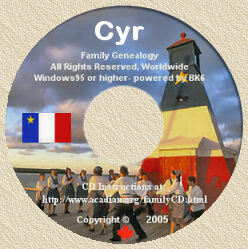 Following is a summary of "major" surnames (and quantity) for which genealogical information is provided, on my FIRST "In Search of Our Acadian Roots; ©1994 to current date" and SECOND "Acadian-Cajun Family Trees; ©1999 to current date" CD-ROM's. Please understand that there are many many additional surnames on the CD's, than those listed below. If you look at the foot of each surname list, you'll see the minimum quantity I established as the criteria (the minimum number changes, depending on the letter), which I used to determine if the surname should be included in the following summary. Some names may not be in their proper alphabetical order...my apologies (I tried)! However, in some instances I have purposely done this to assist you sort out the numerous name spelling variations, which is very common with French surnames. Also, I may have accidentally missed some of the 'major' surnames but, generally speaking, if the surname you're searching for is _not_ listed below, it's because its frequency on the CD's is less than 50 times. (IMPORTANT NOTE: To give some idea of the massive quantity of surnames on the CD's, I've included _every_ surname appearing on the FIRST "In Search of Our Acadian Roots; ©1994 to current date" CD for those surnames starting with the letter "V" only...check it out and see for yourself! If you don't see the surname you're looking for listed somewhere on this page... and if it's Acadian and/or French-Canadian, it's likely because it appears less than 50 times on the CD's. And, if it's the only surname you're interested in, then the CD's would probably not be of great benefit to you. Note: I've only listed those surnames which appear a minimum of 50 times on the CD. Note: I've only listed those surnames which appear a minimum of 30 times on the CD. Click here to view surnames on the CD's starting with the letters "C"
Click here to view surnames on the CD's starting with the letter "D"